Blind and buried vias are only available on boards with at least four layers. Unlike regular vias on a two layer board which connect the two surface layers, buried and blind vias connect the inner layers with either other adjacent inner layers or adjacent surface layers. Blind Vias: Connects an inner layer with the adjacent surface layer, they are only visible on one side of the boards and so are called 'blind' vias. 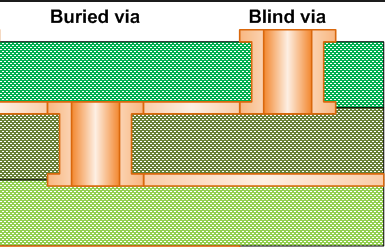 Buried Vias: Connects two adjacent inner copper layers. They are not visible from the surface and so are 'buried'.